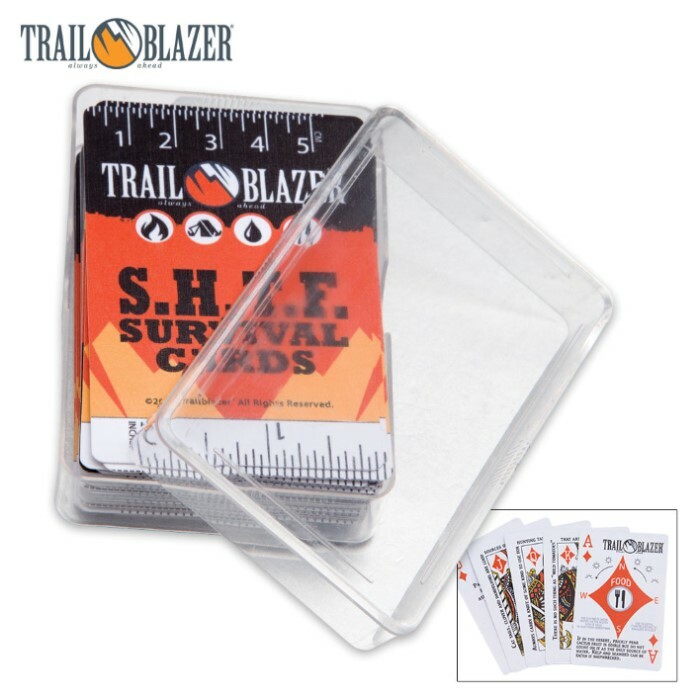 Trailblazer Survival Playing Cards | BUDK.com - Knives & Swords At The Lowest Prices! Knowledge is one of the most important tools to have in a dire situation! Fire, shelter, water and food are the necessities of sustaining your life and knowing how to attain them in a survival scenario is the difference between life and death. 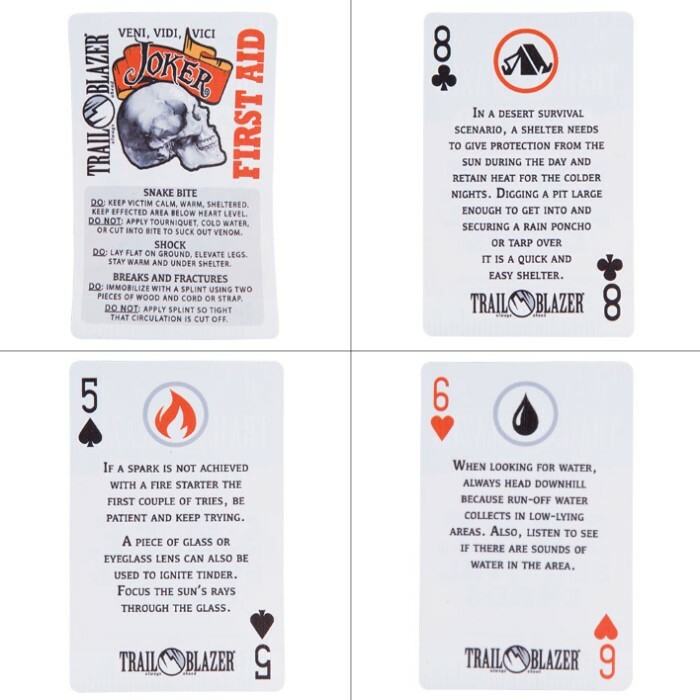 Trailblazer's Survival Playing Cards give you quick, vital information, in a compact and organized form. Each suit of the actual playing cards represents one of the necessities - fire, water, shelter and food. All cards within the suit will give tips on its specific subject. 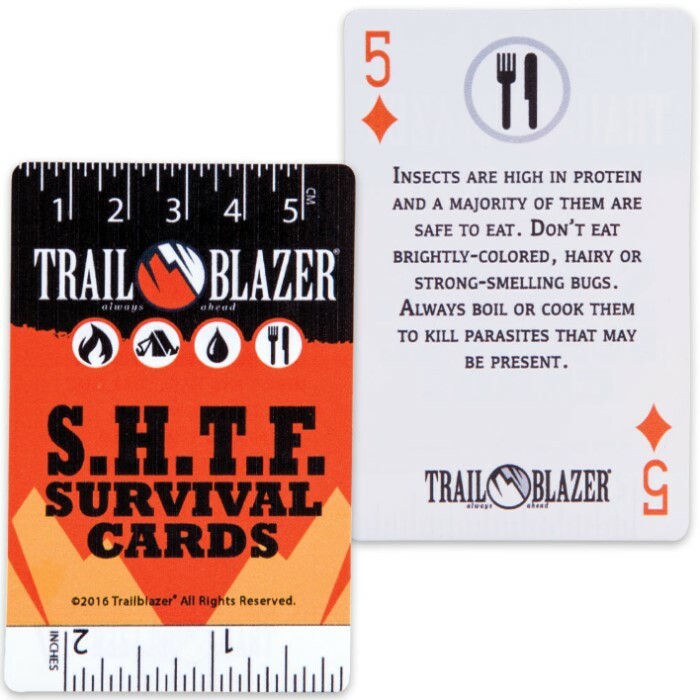 Just drop them in your camping, survival or bug-out gear because having a deck of cards on hand is always good but you’ll also have great survival knowledge on hand, too. Thanks BUDK, these cards are great. Not only good for a game, but excellent advice for survival. They are not your usual deck of playing cards. This is A Great Idea Item,Can Play Cards and Learn Some Survival at Same Time. Perfect for the Camper. Going to Use These in the Travel Trailer. The pictures above accurately reflect what you'll get. The cards come in a plastic box and the plastic box comes in an outer heavy paper box such as a standard deck of cards come in were you to purchase it in a store or shop somewhere. The cards have a survival tip around the edge of the card concerning four survival areas such as food, shelter, et cetera. The plastic box can be used to store cards while you're playing (after winning a hand) if you're playing on a surface that's not as clean as you would like it to be! With these cards, you can learn something while you're playing card games! It's a good gift for ALL ages! From kids who have learned to count and are moving into games, to kids of junior high and high school age who are playing blackjack, draw-poker, and other various card games, to seniors who want an interesting deck of cards that are better protected via the plastic box! I highly recommend them!